nanoRep and I recently partnered on a webinar to discuss reducing effort in your customer experience. We discuss the Customer Effort Score, simplicity, and how to use self-service to prevent customer disloyalty. 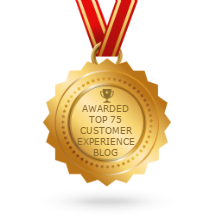 You can view a summary at http://www.nanorep.com/blog/VIDEO—Thinking-is-Bad-Drive-Customer-Loyalty-by-Simplifying-Your-Service-Experience. Enjoy! Making the customer experience easier really shifts the long term customer satisfaction with our large retail customers. Often times work we do as professional consultants for large retailers focuses on delivering excellent documents and systems that work as designed. When excellence is delivered it does not always end with a satisfied customer. If the team delivering the solution is not readily available to the customer throughout the process. If the customer is asked to test a solution when they have not been trained. The result is a customer so worn down by how hard it is to implement that they do not appreciate the end result. Photos from Journey Mapping Workshop What’s the customer experience focus for 2015?